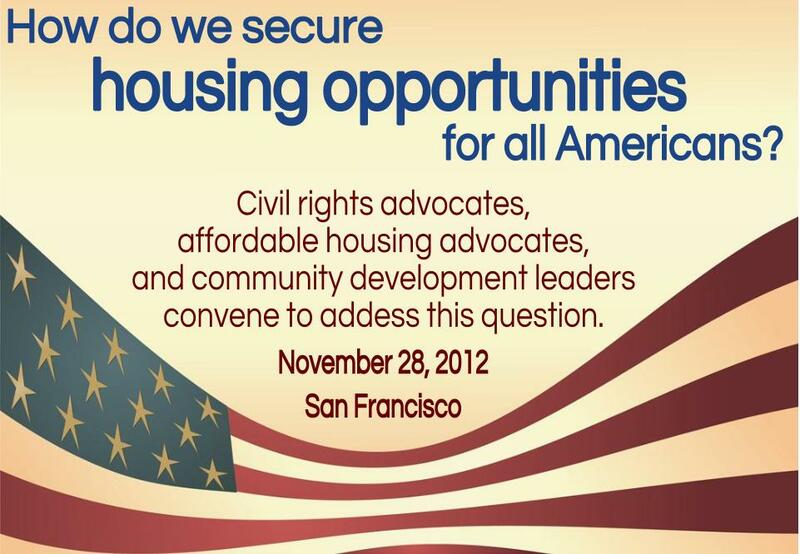 ← Is fair housing a civil right? Today, dozens of experts and leaders will convene in San Francisco to address this challenge: How do we secure housing opportunities for all Americans? Experts from three fields— civil rights, affordable housing, and community development— will share new research and ideas on a wide range of topics, from sustainable development to preservation, from schools to urban revitalization. The convening’s subtitle, “Toward a Shared Vision,” reflects a desire to pool knowledge and share perspectives across disciplines in order to propel progress. Praxia Partners’ principal, Joe Recchie, is attending. “Their work is fascinating,” he said. “I’m looking forward to learning from them.” The focus of the event matches his passions and expertise: the Sustainable Community Investment Fund and its team has been modeling one strategy for restoring home values in the wake of the foreclosure crisis. The Ford Foundation, Open Society Foundations, and the Federal Reserve Bank of San Francisco will host. Check back here for updates about this powerful convening. This entry was posted in Building Neighborhoods and tagged civil rights, collaboration, fair housing, housing, Housing Opportunity Convening 2012, Joe Recchie, Sustainable Community Investment Fund. Bookmark the permalink.